Update: The uber popular Fallout Shelter game now has now been released for Android users. While we knew this day was coming thanks to Bethesda's annual fanfest QuakeCon 2015, the little mobile game is now available to download for free from the Google Play store, worldwide. Even cooler, a Fallout 4 character named Mr. Handy has been added to the Shelter roster to help you collect resources, fight off raiders and new threats like Deathclaw invasions and Molerat infestations. This update is available for both iOS and Android platforms. With Fallout 4 only five months away from release, iOS gamers have been satiating their intense cravings by overseeing their own vaults in the cute mobile game, Fallout Shelter. 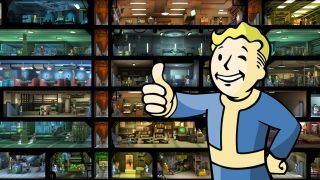 So far, Android owners have been left out in the cold (nuclear winters can be tough), but it now seems that Fallout Shelter is going to arrive on the platform in August, according to a response Bethesda's Pete Hines gave to a fan question on Twitter. Hines told the fan that the game is coming along nicely, and that while there is no official release date, Fallout Shelter for Android "should be out next month." Hopefully, the game will be enough to hold off fans until the Fallout 4 releases on PS4, Xbox One and PC on November 10.